The DNA sequence of HlyU, a transcriptional activator of hemolysin gene, and its crystal structure was recently determined. 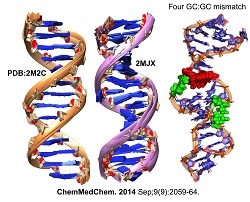 The double GC:GC mismatched DNA NMR Structure was solved recently at Bose Institute. Proteins are the workhorses of the cell. They function as catalysts, provide architectural support at the molecular level, transport small molecules and transduce signals. 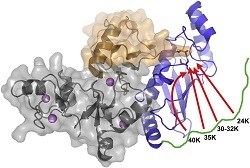 In order to understand the key to their mechanism of action, it is important to probe their functions, either with wild type or engineered proteins. The main focus of the project is to work with various proteins (and nucleic acids) with a focus on structure-function relationships. Prof. Siddhartha Roy’s research focuses on Peptide therapeutics, Chemical Biology, Transcription; Protein-DNA Interactions. 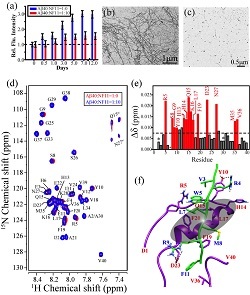 Prof. Gautam Basu’s research focuses oni) peptide conformation and thermodynamics and ii) interaction of glutamyl and gutaminyl-tRNAsynthetases with cognate and non-cognate tRNA. Prof. Pinakpani Chakraborti’s research focuses on i) Structural studies on proteins from Vibrio cholera and ii) Bactericidal effect of nanoparticles (NP) and protein-NP interaction. Prof. Kalipada Das’s research focuses on Structural aspects of interaction of substrate proteins with molecular chaperones, Structural mechanism of regulation of the molecular chaperone function by small molecules, Molecular interactions in amyloid fibril formation and Protein nano-particle interactions. Prof. Bhabatarak Bhattacharyya’s group focuses on interaction of small molecules with tubulin. Prof. Jayanta Mukhopadhyaya’s group focuses on mechanism of gene regulation by various transcriptional factors and sigma factors in prokaryote, studies on `sigma cycle' paradigm in prokaryote and identification and characterizion of inhibitors of M. tuberculosis gene expression. Prof. Ajit Bikram Datta’s group focuses on Structural studies of proteins and multi-protein complexes and post-translational modification of proteins by ubiquitin and ubiquitin-like proteins. Prof. Pradeep Parrack’s group focuses on gene regulation in prokaryotes and protein-DNA interactions. Prof. Rajagopal Chattopadhyaya’s primary interest is determining three dimensionalstructures of macromolecules by crystallography and other methods. Prof. Subhrangshu Chatterjee’s research is focused on designing and screening of small ligands, peptide, DNA/RNA aptamers that selectively bind G-quartet structures, and, small peptide / ligand/ aptamer-G quartet bound solution structures by NMR spectroscopy. Prof. Anirban Bhunia’s research is focused ondesigning of novel antifreeze peptides, structure and dynamics study of amyloid beta (Ab40) protein in micelle environment and developing novel antimicrobial peptides. Molecular Mechanism of Fibrillation of Amyloid Beta (A-beta40) Peptide and design of Peptide Based Inhibitors. A model of the RING E3:E2~Ub complex showing E3-mediated activation of Ube2E self-ubiquitination.